A Compendium Of Battles From 502 To 31 B.C. Part one of the book is an 'Introduction to warfare during the Roman republic'. This short but well written preamble is necessary for the neophytes among us, as is the next section 'The Navy of the Roman Republic'. These two together are very good primers on Roman republican land and sea warfare. The book itself is an alphabetical listing of all of the battles and some sieges from early Rome to the end of the Republic. The author lets us know which ancient sources he used. If a battle is not listed, it is because of a dearth of information about it. The listings in the book are not meant to be complete histories of each battle. They are at most two pages long, and as little as a small paragraph. A lot of the major battles are accompanied by maps that show how the action took place. The author stresses that he takes the ancient sources at face value and does not analyze or embellish the accounts. Where there are differences in the different ancient authors he lists them. After the introduction to Roman warfare there are two very helpful lists of all the battles in the book. The first is an alphabetical listing of the battles. The second is a chronological list that helps you to follow the battles through the myriad of Roman wars. There is one caveat for complete Roman newbies. The description of where the battles took place would be instantly recognizable to Roman eyes. Unfortunately, that is not the case for most 21st century English speaking people. The good news is that maps of ancient Rome etc. are just a click away for most of us. So finding out exactly where each battle was fought is not that difficult. One of the book's assets is that you can see the progression of parts of Roman history through the tales of each battle. The civil war after Caesar's death is one example, and the war against Antiochus The Great is another. This book will certainly lead readers to fill in the gaps by reading more Roman history. If that is all the book does it is certainly worth its weight, but the book is much more than that and is a great reference for old hands of Roman history. The maps are especially useful for understanding exactly what each side in the battles had to contend with. 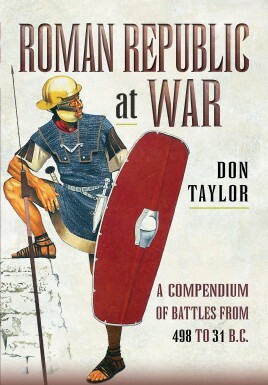 Book: Roman Republic At War: A compendium Of Battles From 502 To 31 B.C.